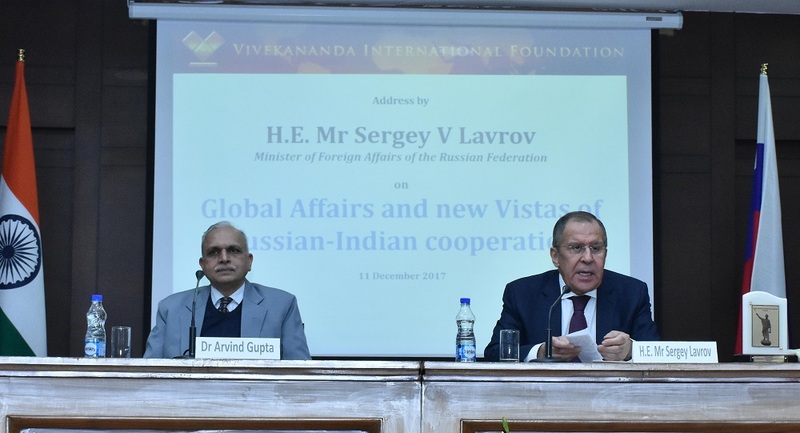 His Excellency Sergey V Lavrov, Minister of Foreign Affairs of the Russian Federation, delivered the First Kadakin Memorial Lecture at the Vivekananda International Foundation (VIF) on 11 December 2017, to a select gathering that comprised India’s national Security Advisor (NSA), Mr. Ajit Doval, Foreign Secretary, Dr. S Jaishankar, members of the diplomatic corps, members of the strategic community and media. 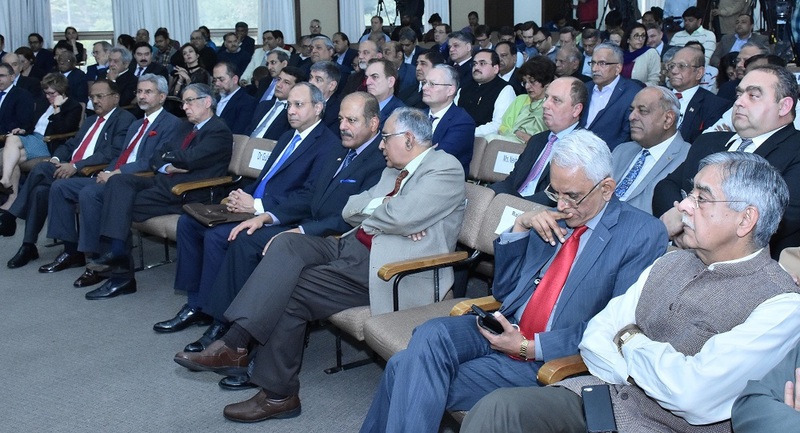 The special lecture titled, ‘Global Affairs and New Vistas of Russian-Indian Cooperation’, has been instituted in memory of former Russian Ambassador to India, Alexander Kadakin who served at New Delhi since 2009 until his demise in January 2017. H.E. 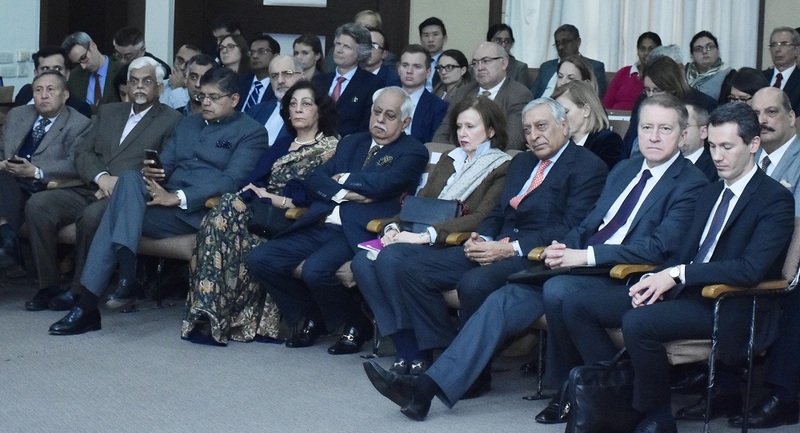 Lavrov began his lecture by recalling Ambassador Kadakin, his commendable role in cementing India-Russia relations and for being a true friend of India. 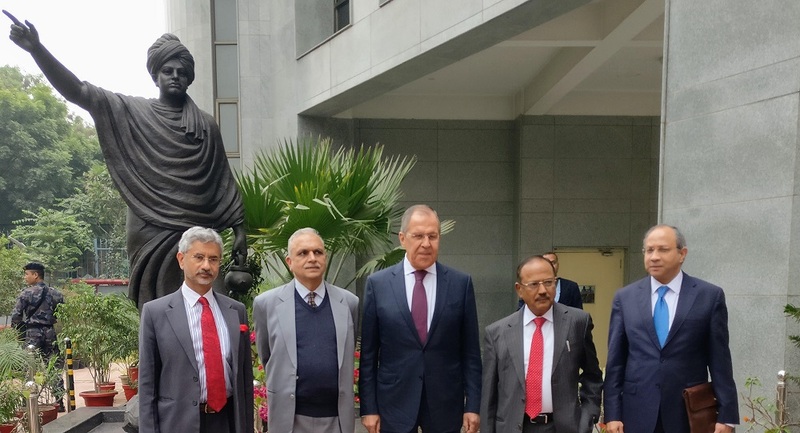 Starting his career as Third Secretary at the Russian Embassy in New Delhi in 1972, Kadakin served in India on many occasions, including as Ambassador earlier from 1999 to 2004 and the as Minister Counselor between 1989 and 1992. He spoke fluent Hindi and served as translator for Soviet Premier Leonid Brezhnev’s official visits to India in the 1970’s. A major part of the visiting foreign minister’s address was devoted to India-Russia relations both in the bilateral and multi-lateral arena. On global issues, he emphasized the importance of joint Indian-Russian initiatives within various multilateral frameworks like the Brazil, Russia, India, China and South Africa Grouping (BRICS), the Shanghai Cooperation Organization (SCO) and the Russia, India, China (RIC) Dialogue. The Foreign Minister specifically stressed upon the importance of the SCO said that Russian welcomes India into the SCO as an important country in promoting multilateral political, security economic and people-to-people interaction within the group and to foster a stronger Eurasian Union. He also was optimistic about Pakistan’s inclusion in the SCO along with India and felt that the SCO could emerge as an important grouping for dispute resolution between India and Pakistan. Talking at length on OBOR, the Minister said that Russia feels the concept is very interesting that could emerge as an important mechanism for building harmonious relationships and to facilitate deeper regional trade and investment. H.E. Lavrov said that almost all the central Asian countries have already signed contracts with China for cooperation in the OBOR while Russia and other members of the Eurasian Economic Union have also concluded economic cooperation agreements with it. Foreign Minister Lavrov stressed the importance of a multilateral region-led interaction to stabilize Afghanistan. He recognized the legitimacy of the current Afghan Government and mentioned all those multilateral organizations which consist of Afghanistan’s neighbouring countries and other regional states - such as participants of the SCO, the Moscow format, the Heart of Asia-Istanbul Process, the Kabul Process and the Regional Economic Cooperation Conference on Afghanistan - as integral to settling the Afghan problem. His views on the Taliban were candid when he mentioned that the role of the Taliban in stabilizing Afghanistan could not be overlooked but that they would have to accept norms and rules laid down by the UN. 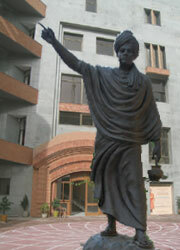 He disagreed with the US policy on Afghanistan and said that the US was compromising on UN mandated norms. H.E. Lavrov denied that Russia had supplied arms to the Taliban though he accepted some contacts with them purely for the release of hostages. H.E. Lavrov also spoke about a common Russian and Indian vision for the Asia-Pacific and in maintaining regional security and economic architecture that is open, inclusive, and based on multilateralism, universally recognized principles of international law, and that are imperative for lasting peace and stability in the region. In this regard he reiterated the commitment of both the nations to further promote dialogue on regional security architecture including within the East Asia Summit framework. The Minister lauded India's independent foreign policy approach, but in an indirect reference to the ‘Quadrilateral’ , he said, "We believe that sustainable security architecture in the Asia Pacific region cannot be achieved through bloc arrangement and is only possible through an open ended collective basis." The Russian Foreign Minister also talked about the need for peaceful settlement of the disputes, saying that use of force or threatening to use force will not resolve any issue. Calling India a key partner for Russia, he said further strengthening of ties between the two countries can address numerous problems in the Asia Pacific region. Foreign Minister Lavrov made special mention of the scourge of terrorism and spoke of the common need to combat ideological dimensions of international terrorism. He further said that Russia and India both “condemn terrorism in all its forms and manifestations including the recent heinous terrorist attacks around the world and reaffirm our determination to prevent and counter terrorism in all its forms and manifestations. We reaffirm that all acts of terrorism are criminal and unjustifiable irrespective of their motivations, committed wherever and by whomsoever.” He emphasized the need for a comprehensive approach in combating terrorism, and in this context resolve to step up cooperation to prevent and counter terrorism and radicalization, combat the spread of terrorist ideology and propaganda and stop sources of terrorist financing. He said that India and Russia were on the same page is stabilizing Afghanistan and here we should not become victims of the Western discourse that sometimes tends to plant misleading stories. In the bilateral domain, the Minister recommended the need to build an economic stake by both Governments to take this relationship to the next level as both countries had pledged to take their bilateral trade to 30 billion dollars over the next few years. He said that both countries recognize the importance of increasing the efficiency of existing economic cooperation mechanisms at all levels – by encouraging direct contacts between the business communities of the two countries. Both need to look at ways to strengthen industrial cooperation and create close technological alliances and integrated manufacturing chains in those sectors where both Russia and India have significant capacities in terms of personnel and resources. Here, he emphasized Russia’s commitment to eventually ensure flow of technology to assist the ‘Make in India’ programme of the present Government. The Minister concluded his address by mentioning that India and Russia have coinciding priorities, and therefore, both Governments should encourage their respective communities to engage with one another through greater economic engagement, stepping up of people to people contacts and educational and cultural exchanges in a more robust environment.